OK, that's about the extent of my French - it's about as good as my Hindi. 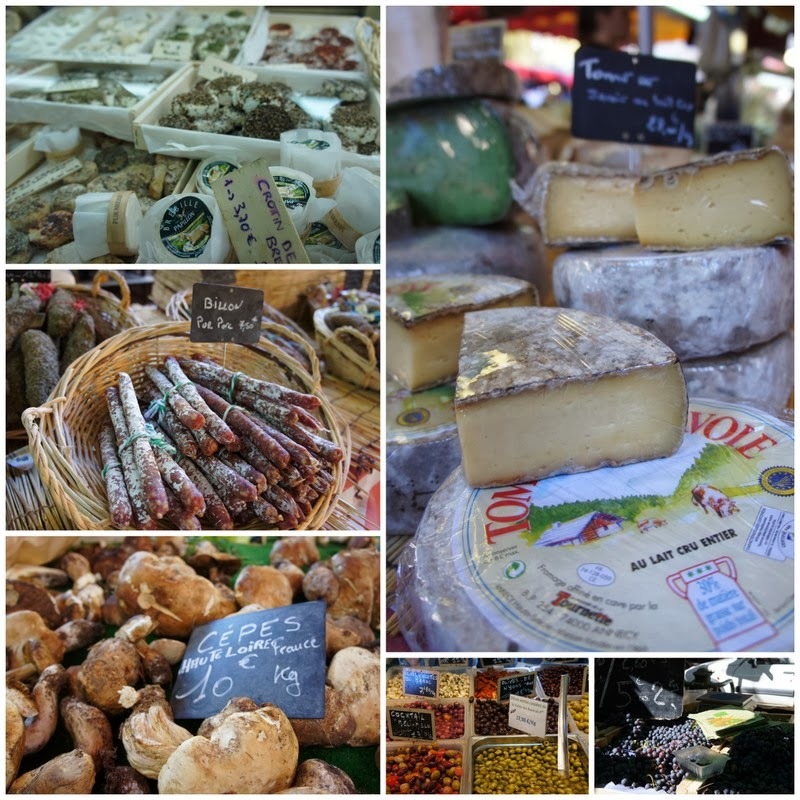 So here we are in Provence, in the South of France. The sun is shining, we are staying on a delightful converted lavender farm and I can't stop eating. Oh the things I have been missing! All types of smelly cheeses, hams, French baguettes, fresh cream cakes and real beef steaks with frites. It's heaven! Freshly hewn lavender - so fragrant! No-one does a tart like the French! Come back later when I will be posting pictures of our cute Provencal cottage...it's so beautiful here! Thanks for stopping by my little piece of heavenly France. 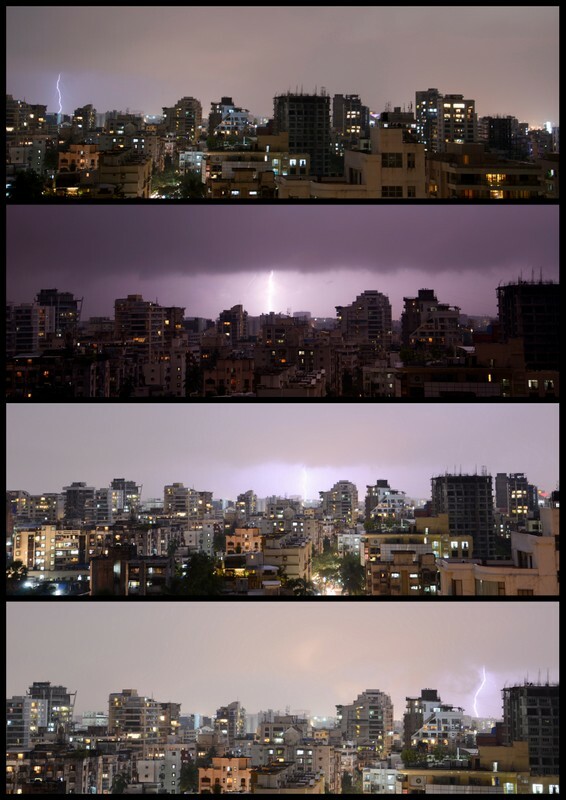 I was excited last night to almost get the settings right on my new Nikon camera, and be able to take photos of the awesome electrical storms that have been hanging over Mumbai for the last couple of days. I made the little collage below - the changing colour of the night sky was so beautiful (even if the view in front isn't particularly attractive!). It was also interesting to capture the lighting as it moved sideways in the distance. To get this result I set my camera up on a tripod and used a shutter release cable. I switched the mode to Manual and set the ISO really low - between 100 and 200 and aperture F5.6. Shutter speed put on 'bulb' mode. This means you when you hear the thunder, you can press the button on the shutter release cable and keep it open until the lighting appears...then you take your thumb off the button to close the shutter. Et Voila! Thanks to Jayanth Sharma on my Toehold photography course for teaching me the technique. As this was my first go, there is obviously a lot of improvement to be made - I would love to capture a classic photograph of the whole sky filled with lightning. OPERATOR: "Sorry sir, I am not understanding you?" OPERATOR: "Sorry sir, what was that?" OPERATOR: "I am wery wery sorry sir, I am still not understanding you"
MR JULES: "OK, give me two NAAN!" OPERATOR: "Yes sir, your order is on its vay"
To be honest, since I wrote that post, not a lot has changed when it comes to ordering food telephonically. 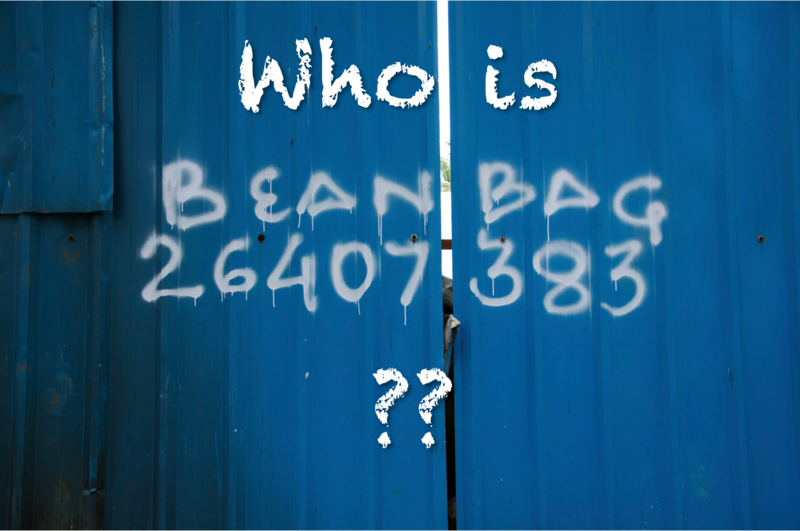 To save ourselves from the ritual humiliation, we tend to limit ourselves to ordering only from those places where a) we know the operator understands English or b) where they store our telephone number and can automatically look up our address. 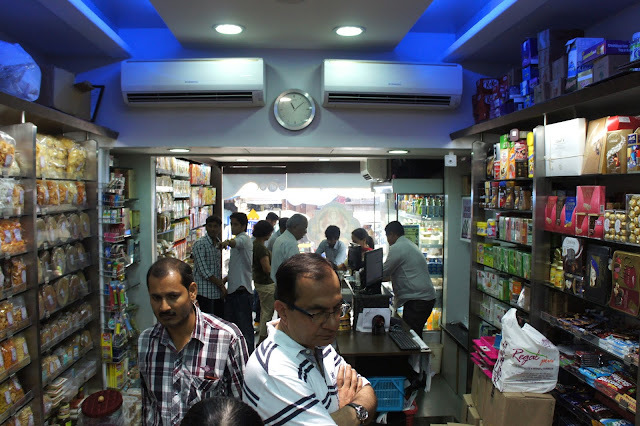 We are therefore limited to curries from Caravan Serai, Chinese food from Royal China and lunch-time kathi rolls from Faasos. Yes, a cop out, I know! 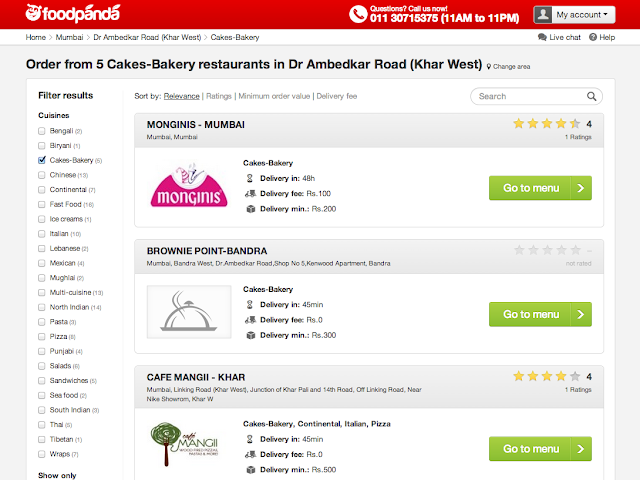 However, I recently discovered a great online multi-cuisine food ordering service called Foodpanda. From what I can gather, this is an international company with a relatively new presence in India. But I looked up where they operate within our city - which is quite an extensive area in Mumbai - and our address fell within its remit. Phew. So, I decided to experiment and see how efficient the Foodpanda service is: A couple of days ago, working away at my computer and fancying a little sweet-something to go with my 4pm cup of Earl Grey, I went online at Foodpanda. I entered my location (from a rather long list...not sure how scientific it is) and a list of nearest restaurants popped up. I saw that 'Brownie Point' was on there - a rather famous cake shop in the vicinity. Result! 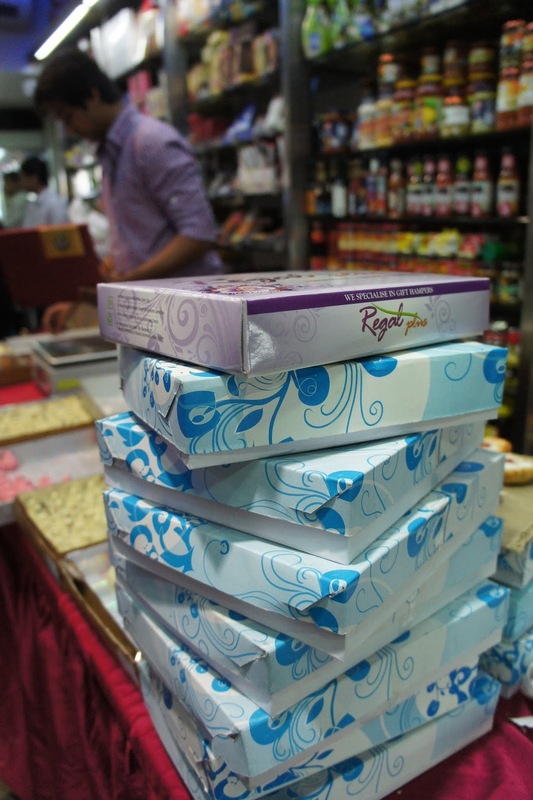 Then, after clicking on Brownie Point, an enormous inventory of sweet things was revealed. That was the only problem..which one to select!? It took me a few minutes. In the end I went for the 'Fruit Almond' - which I thought would be a Dundee style fruit cake. I entered my name and address into the site (stored for later) and there was also a great option to state what change I would need from my cash payment - a 500 Rs note. You can also pay by credit card. I immediately got an email confirming my order (a mere 300 Rs / £3 with no delivery fee) and a note saying it would be a 30-45 minute wait (approximate times are also given as you are making your order). Not bad. 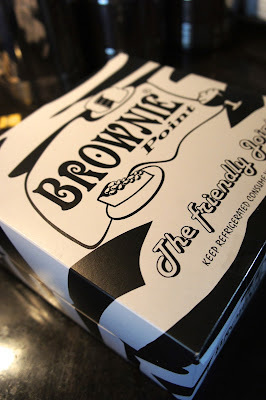 About five minutes later, I got a call directly from Brownie Point asking me if I wanted 'with egg or without egg'.....that threw me a bit as I obviously wanted the transaction to be speech-free (but was impressed that they cater to religious/fasting requirements). I of course wanted my cake made with egg - otherwise it might have been a bit flat! After 20 minutes had passed I got another phone call - from Foodpanda this time - letting me know that Brownie Point was inundated and that my cake would be 15 minutes late. I was also quite impressed by that - and could quite believe that Brownie Point was busy. And it's nice to be kept updated - it's less likely to make the customer unhappy no? Anyway, 10 minutes later and my cake had arrived. 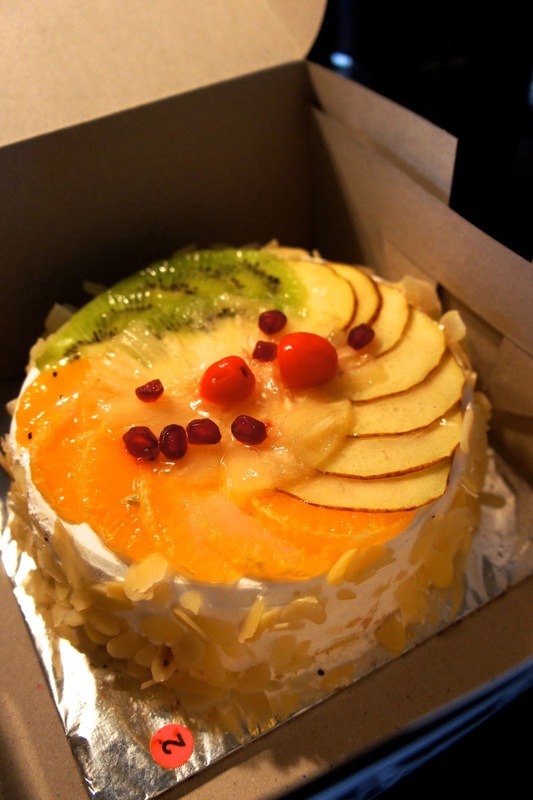 It was actually a big sponge and cream cake topped with fresh fruit and slivers of almonds. 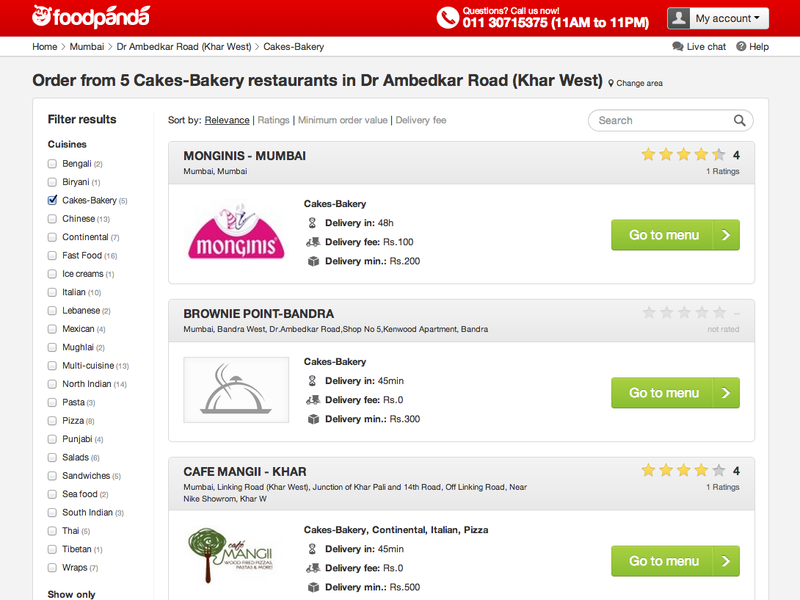 So if there was one criticism of the Brownie Point page on Foodpanda - is that perhaps pictures of the foods would be helpful. 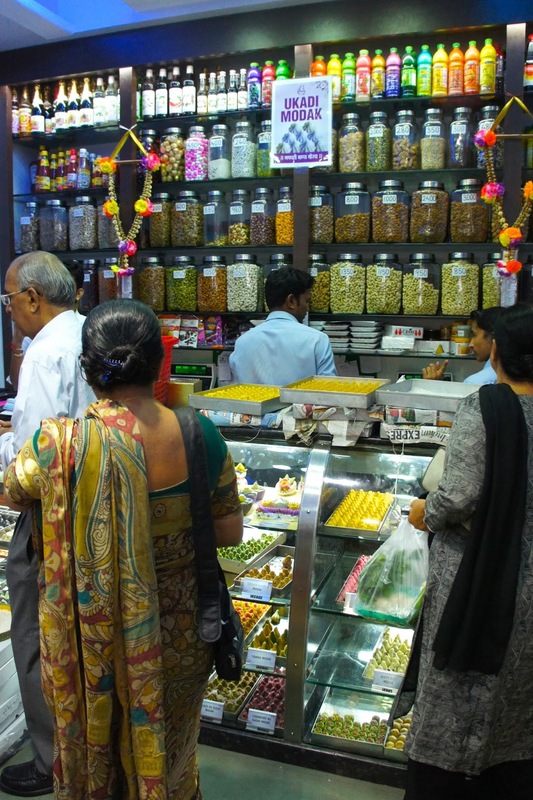 But most restaurants in India have extremely extensive menus (Brownie Point lists hundreds of items alone) - so I am not sure how practical it would be to upload that many photographs. I really think this Foodpanda service is going to make life much easier for us non-Hindi speakers - as it takes away the whole stress of making an order that is continuously misunderstood. In fact, I think it will be useful for anyone! I recently had the pleasure of meeting a very friendly duo - Lynden and Sohel - who are launching a new furniture brand called Solli Concepts. In fact they have been working together for a while now, creating contemporary designs and building up a collection of high quality pieces made out of solid wood. When I told them that I like to write about furniture and local craftsmanship, they allowed me special access to their workshop so that I could see where the magic is created. 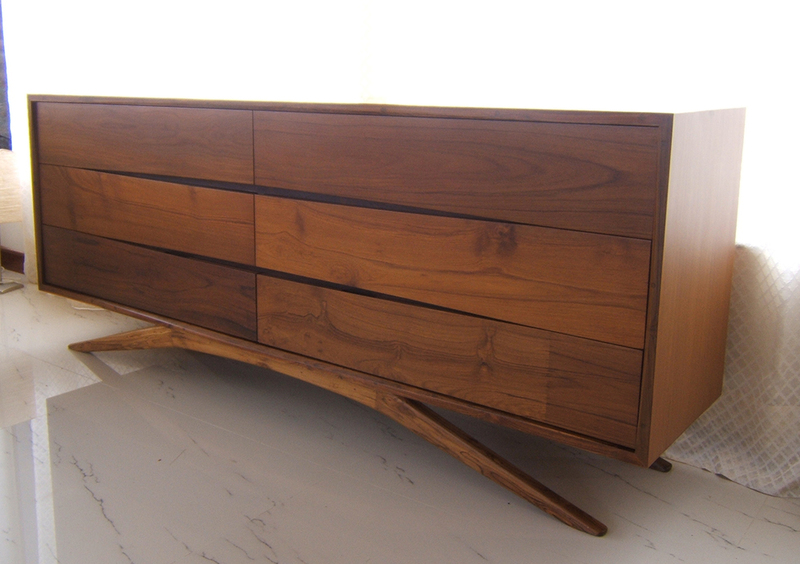 You know how much I like a bit of solid wood furniture! Sohel is the design genius behind the brand (I am calling him that - he is quite self-deprecating in person). He actually has an engineering background and this is very evident in his work. Sohel's formal training has been subtly translated into structured pieces that have a Scandinavian style and simplicity. 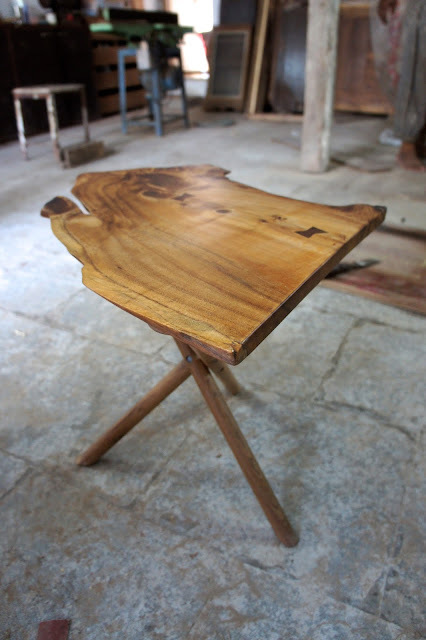 For example the teak dining table with its large piece of shaped glass atop a 'structural' pedestal. 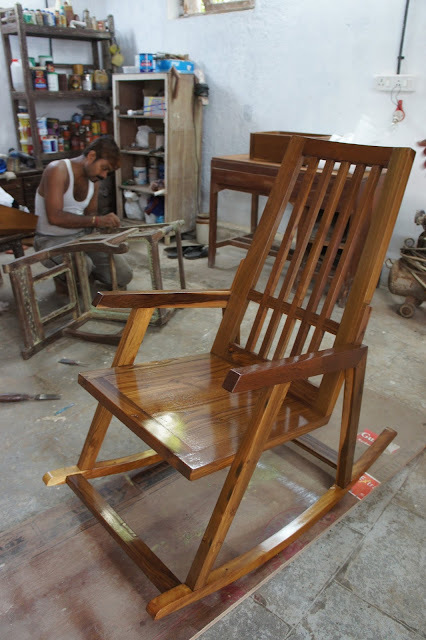 And the precision engineered rocking chair which would look good in any traditional or contemporary setting. 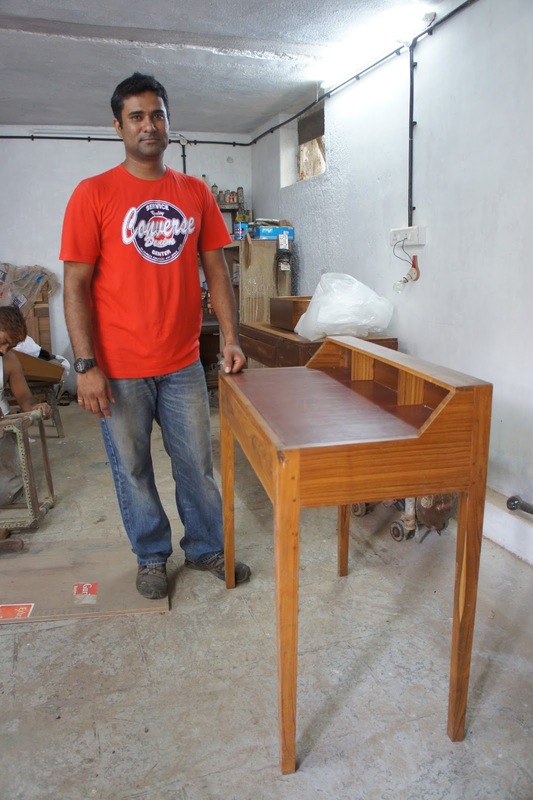 Sohel with his gorgeous writing table design. The level of workmanship and attention to detail is quite unlike that of traditional Indian carpentry that you might see at Chor Bazaar and Jogeshwari workshops. Japanese and western joinery methods are widely used (for example joints will be dovetailed instead of being nailed together) and there is the combining of woods such as rosewood with teak. And thought has actually gone into ergonomic and space-saving design. 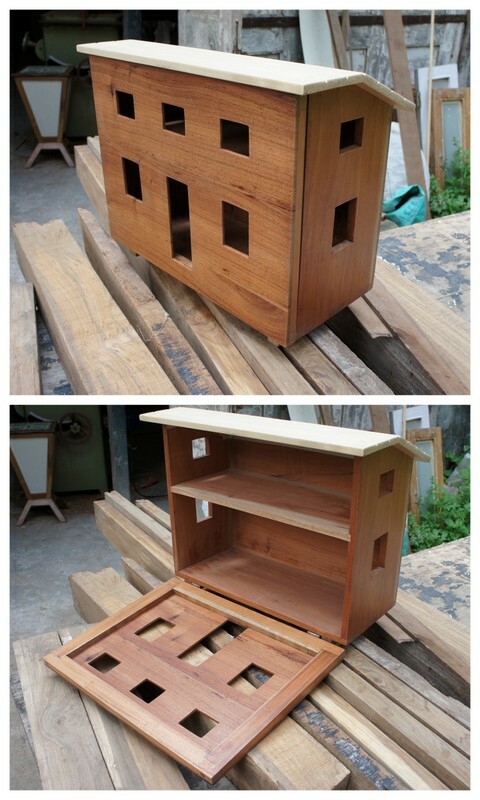 Take the specially commissioned teak bar cabinet for example. To the naked eye, it appears to be a shelving unit - but open up cupboards concealed in the frame surrounding it - and you will see that it is actually a drinks cabinet! I also love the 'Ott'ee' table that is detailed on the Solli website - on one side it is an ottoman...but turn over the leather clad top and it then becomes a coffee table! All of the items are tested for comfort and durability and all pieces are varnished with several layers to prevent wear and tear. Quality is key. 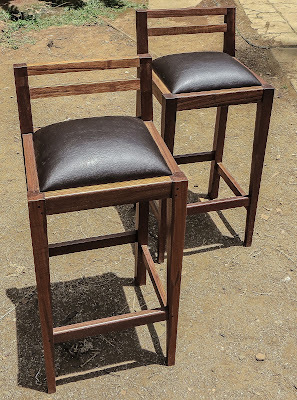 Sohel and Lynden also go to great pains to make sure that all woods that are used are environmentally sustainable - such as the reclaimed teak widely used in their work. A modern take on the traditional Indian rocking chair - used on verandahs everywhere. 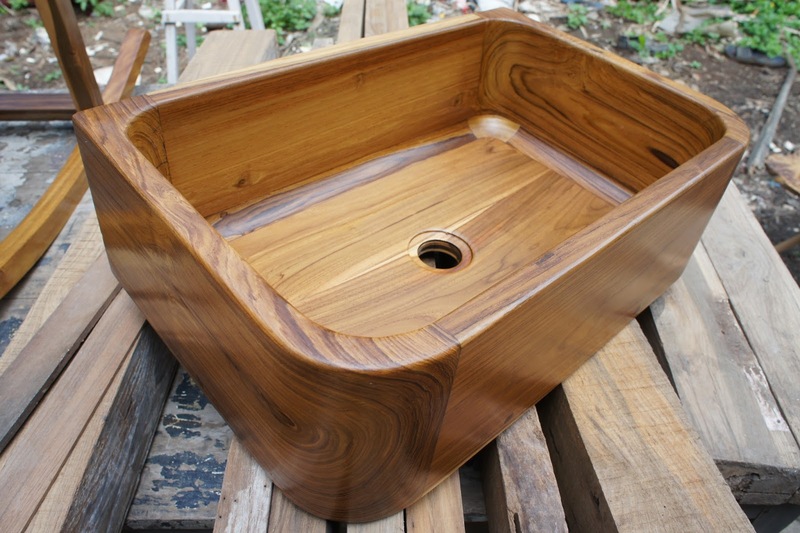 This one is currently being tested for design ergonomics and finish. Such an eye for detail! Lynden is the business brains of the partnership - having worked abroad he also has an understanding of western aesthetics and brings direction to Sohel's work - work that definitely needs to be lauded and 'put out there'. 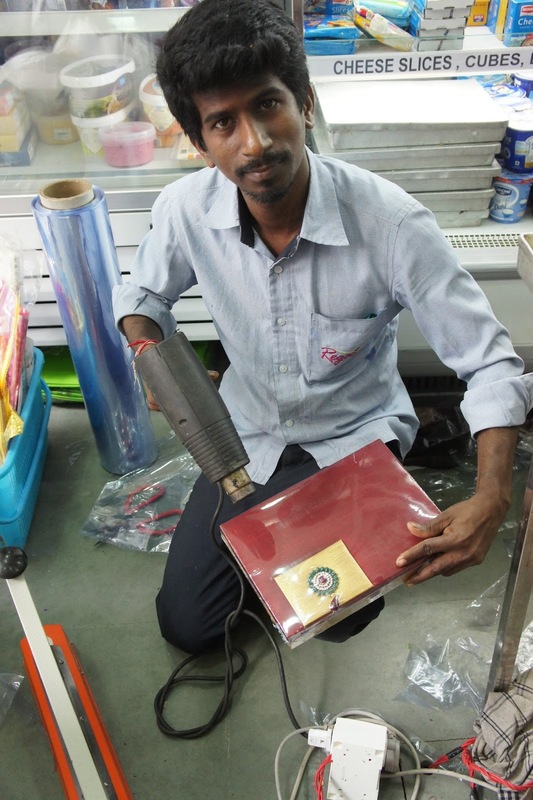 Lynden explained to me that they want their products to appeal to a clientele that has an appreciation of global design - moving away from the gold plated and wood veneered tastes of modern Indian society. Tastes that have no lasting impact and are easily peeled away. 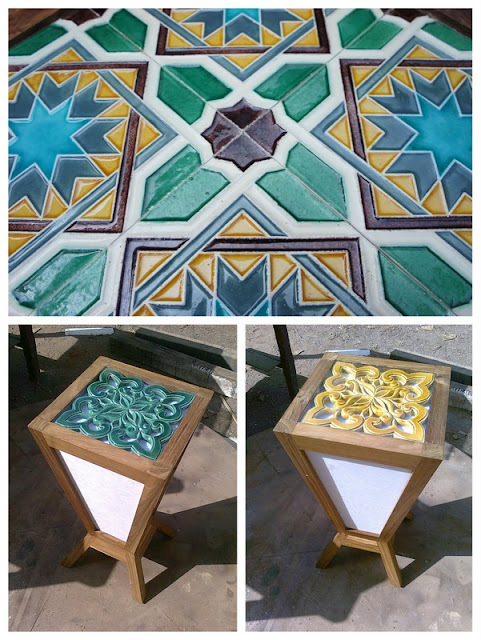 Solli's products - whilst being mostly contemporary - still have a timeless, heirloom quality. For anyone wanting to work with them as a design team (and that includes clients around the globe), it is also possible to commission one off bespoke pieces that fit the scale and style of your home. When I visited the workshop, they were also working on a few smaller items - such as the chopping board chequered with contrasting teak and rosewood - and a really cute Scandinavian style dolls house. On the website, you will also find an elegant art deco influenced cigar case and a beautiful jewellery box (hint hint Mr Jules!). These items would all make wonderful gifts. Solli also has a furniture restoration arm which helps to fund their R&D - when I visited the workshop, there were men busy restoring old pieces as well as making the new stuff. Like me, they also have a passion for the Art Deco era (which is reflected in some of their designs). Please do get in touch with the guys to discuss your furniture and restoration requirements - details are at the bottom of this page. Sohel and Lynden are bright, enthusiastic, innovative and flexible - I am 100% sure that you won't be disappointed by them! Very cool bar stools. Making me think that we really need a bar in our living room! 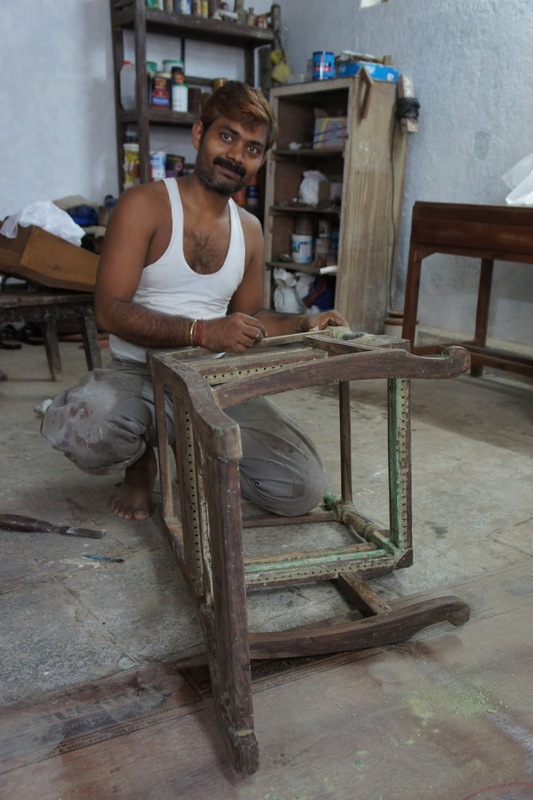 This was made with a characterful piece of wood that was actually going to be disregarded - by a Japanese carpenter in Pondicherry that Sohel has been working with. 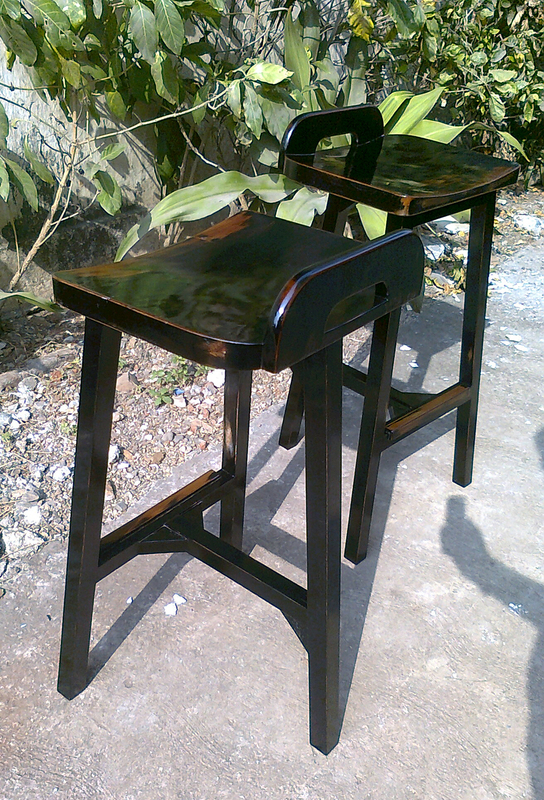 But Sohel cleverly turned it into a unique side table with tripod legs. Love it! 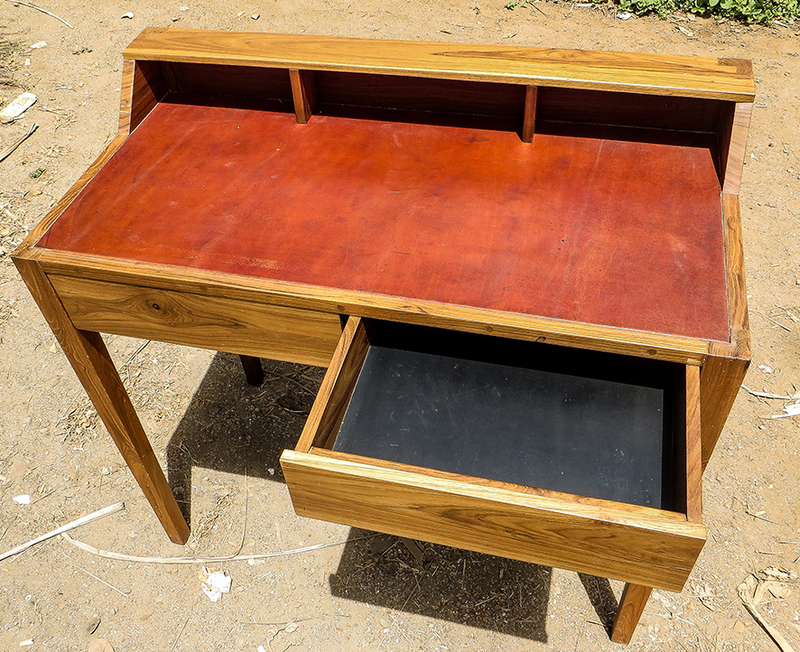 It it wasn't for the fact I have just bought a desk, I would have snapped this up! I love it! No, I am not talking about pear drops, jelly babies, cola bottles, white mice, Curly Wurlies or any of the usual traditional Brit favourites. 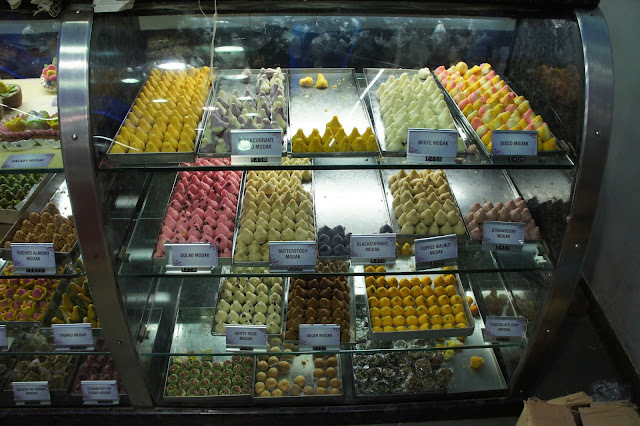 I refer to Indian sweets or 'mithai' which are usually freshly made and bear no resemblance to the hard, plastic wrapped candy or chocolate that is favoured in the west. 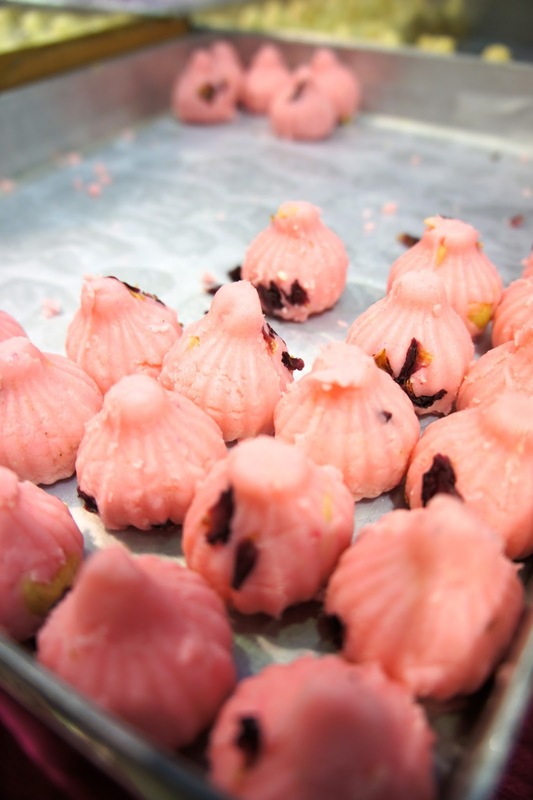 I think of each one as a mini dessert - usually soft, always incredibly sweet and completely addictive to your average Indian. 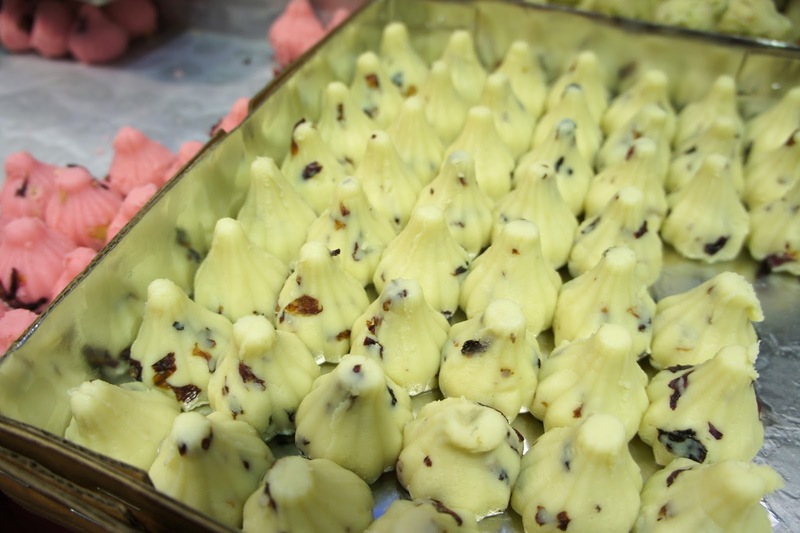 My knowledge of mithai is fairly basic but I knew that it would be good etiquette to take a box of something when we attended the Pandit Ganesha Chaturthi earlier this week (see my previous blog). So en-route, we stopped by at Regal Plus in Pali Naka to make our purchase. When we entered the shop, we found it to be heaving...seems like the rest of Bandra had the same idea that day! But at least it was pretty obvious when we got in there what we were supposed to do - as they had trays and trays of colourful cone shaped Modak on display and special gift boxes in which to present them. 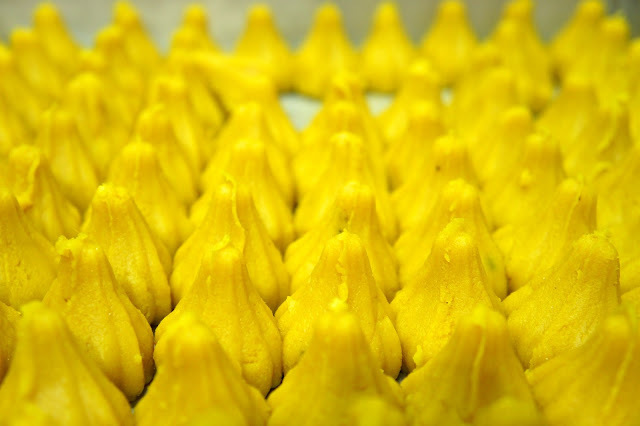 Modak - or Ukadi Che Modak is the favourite food of the sweet-toothed Ganesha and is used in the ritual celebrations of his birthday/Chaturthi. A bit crazy in Regal Stores. It was amusing to see men, women and children pushing and shoving, pointing to the trays and making (demanding) their selections. I don't think Regal Plus was really ready for the Ganesha Chaturthi onslaught and we only managed to make our getaway after twenty long minutes. What really impressed me though - was that our satin box was filled and then resealed in plastic afterwards by a man sitting on the floor operating what looked like a hairdryer. Great service! It's amazing what you can do with a hairdryer! When we got to the Pandit household, I was very relieved that we had brought the Modak - as these were put into a giant cannister on the Ganesha altar and then our box was then refilled with sweets brought by the other guests. So we had something to take away too. How nice is that! 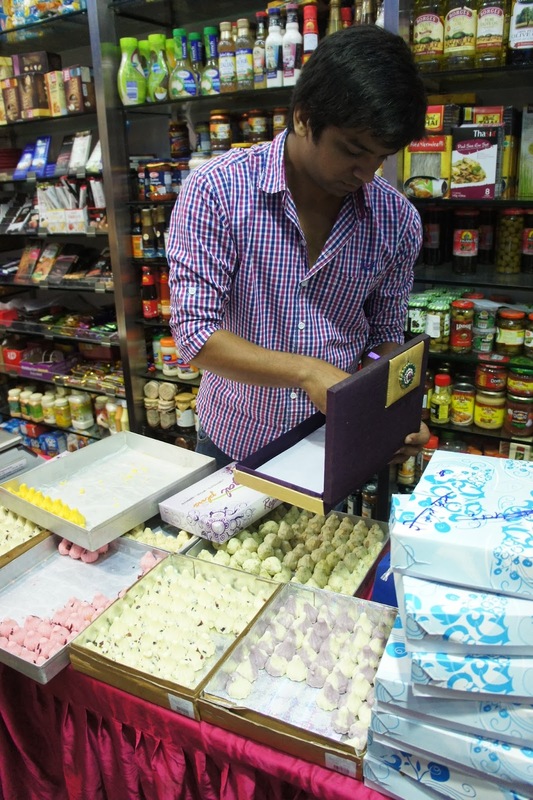 All different flavoured Modaks - didn't know where to start really...so just asked the shop assistant to fill the box with a selection. He did a good job and arranged the colours artistically. Looks like 'rum-n-raisin' but pretty sure it wasn't! 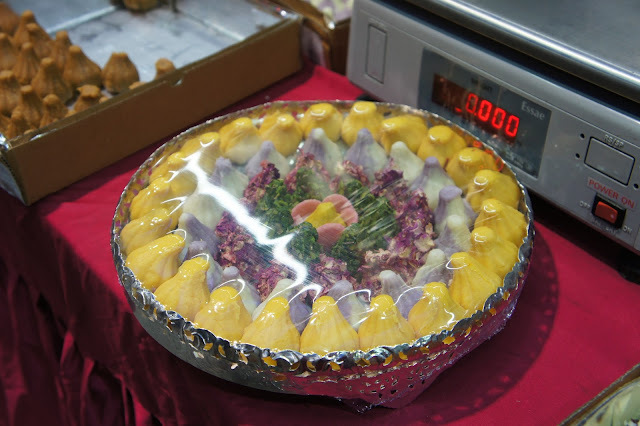 10 out of 10 for presentation! 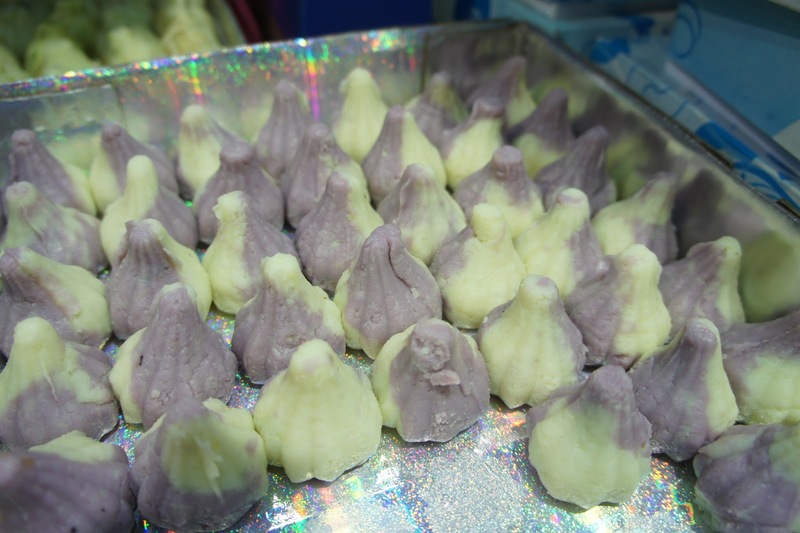 I think these were marzipan fruits surrounding a giant silver Modak. 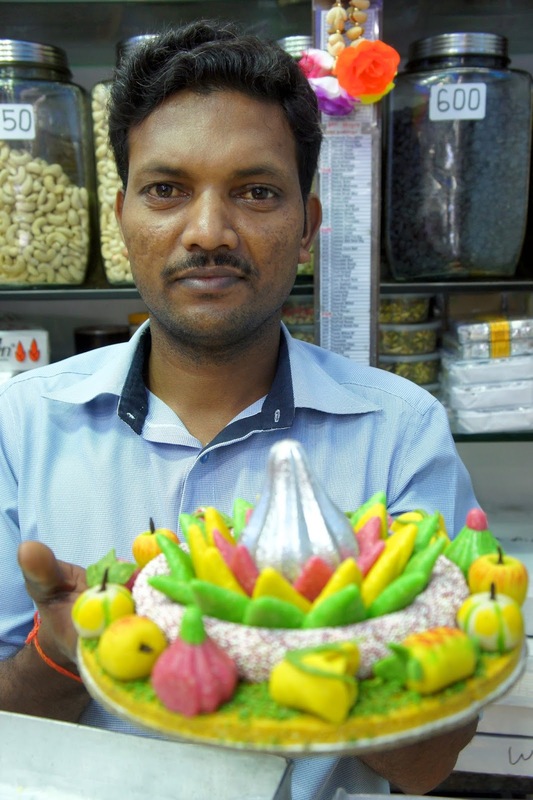 Everything in India is so colourful - the sweets are no exception! 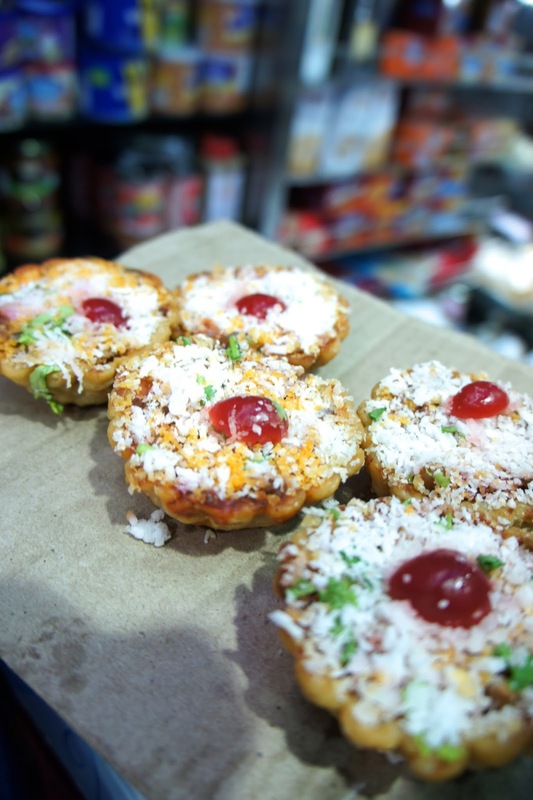 These look like yummy coconut macaroons. When Regal Plus isn't crazy during Ganesha Chaturthi, you can also find a good selection of expat foods in there - from pasta to tinned tomatoes to pesto etc, as well as nuts, breads and spices.